[New for 2016] If you are like me, it means you are not a morning person. I'm ok with being quiet for the first few hours of the day, and that's just in general, but what happens when you get in to that funk where you can't seem to sleep for more than five or six hours every night? Well, you wake up cranky, and what does cranky call for? Chocolate. I do love the chocolate crunchies inside ice cream cakes so it's hard not to like this little sundae cup. When I tried the ice cream cake version, only the middle had the crunchies and they were poorly distributed which kind of ruined the fun of it all. The middle layer here also has that issue, but since there are also a bunch of crunchies on top as well, it's much less of an issue now. Note: we are talking ice cream cake crunchies that have a bit of give to them, not like rock sugar candy type crunchies. 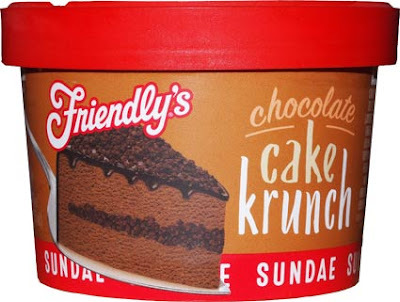 Note 2: I have been frustrated with the texture and quality of Friendlys ice cream recently, but if there is an issue here, the fudge and crunchies distracted from it. Speaking of the fudge, it may not be the best thing in the world, but it fits in with the other components just fine. So if you need a chocolate fix with some texture or have just been thinking of trying this in general, I say go for it (it's only a dollar when it's on sale). I do wish they could master the middle layer of crunchies, but with three chocolate components and nothing else to distract, it's still an easy win. It's not trying to be a million things, it's just trying to be a fun little treat and I say it succeeds. 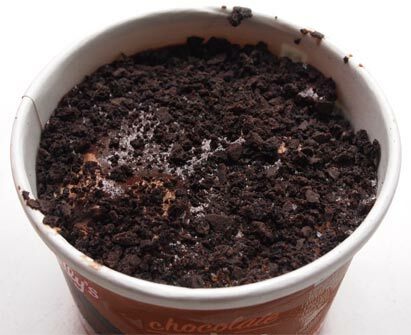 I Love the chocolate crunchies on DQ's ice cream cake aa they are my favorite part of the ice cream cake. Are these the same as DQ's? @Stride: I've had lots of ice cream cake but don't think I've had the DQ version, but I assume it's similar. The crunchies may not be an exact match, but for a dollar, give it a go and see if it does the trick for you. It looks and sounds so delicious. Again, I just want them to be bigger! Haha, I don't like portion control when it comes to ice cream. On another note, I tried Ben and Jerry's milk and cookies last night. It was very good...their vanilla is great but I am an unusual one who isn't such a cookies n cream fan and prefers more plain ice cream with less stuff (just some chips is perfect although I admit to also loving their versions of brownie and cookie dough). But I can see why others love it.